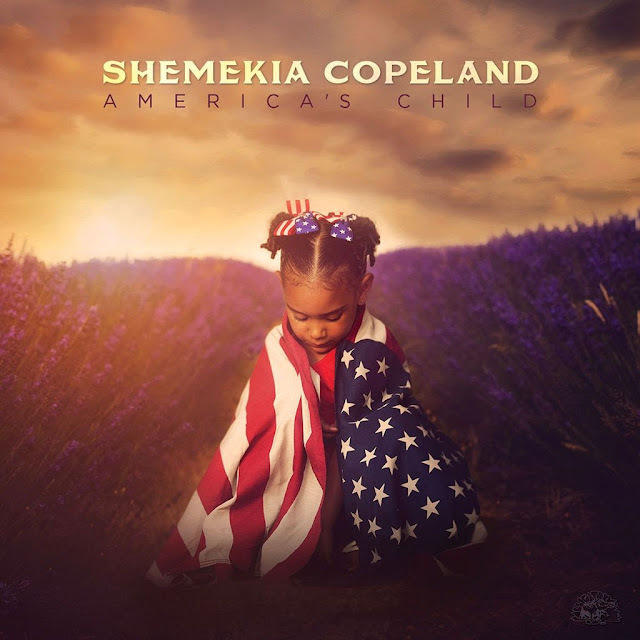 “I'm not like everybody else,” Shemekia Copeland announces rather unnecessarily on her latest, America's Child. Copeland's sound has always been unique, bold, and brassy, attitude coming off her in waves. Since her '98 debut, Turn The Heat Up, the 39-year-old singer has blasted through six records, produced with Dr. John, Steve Cropper, and the Wood Brothers' Oliver Wood. Will Kimbrough is the producer for number 8, her latest on Alligator. This time out, Copeland has changed up a bit for a more Americana format, utilizing some special guests to aid and alter her sound. Former Carolina Chocolate Drop Rhiannon Giddens drops in for some African banjo on “Smoked Ham and Peaches.” Emmylou Harris sings background on a couple of tunes, as does John Prine, also featured in a duet with Copeland on “Great Rain.” Legendary Shack Shakers wildman J.D. Wilkes contributes harp to a couple of tracks, and Steve Cropper lends lead guitar to a track. But just as she professes, nobody can change Copeland much. On “Ain't Got Time For Hate,” the content sounds like Mavis Staples, Kimbrough even capturing a taste of Pops' guitar sound. But Copeland is still herself, powering through it with gospel fervor delivered with enough projection to reach the back rows or nosebleed seats anywhere she shows up. Copeland's showpiece used to be daddy Johnny Clyde's “Ghetto Child,” delivered largely off-mic as Copeland walked around the facility, her voice needing no amplification to reach out and touch every attendee. This one seems to be in contention to replace that, a rousing anthem Copeland can use to reach and rouse audiences for the remainder of her career. It's a first for Copeland to be mentioning Hank Williams in one of her songs, but he gets a shout-out on “Smoked Ham and Peaches,” Americana-ized with Giddens' banjo clucking in the background. But Copeland's magnificent voice, muted somewhat, still stays in churchy blues mode. “When the whole world seems fake / give me something real,” she asks, but it's already here, and its her. “Promised Myself,” with Cropper on lead, is vintage Copeland written by her daddy: deep-dish, hair-raising, soulful blues from the church of Shemekia. It's healing blues, Copeland promising herself she'll never fall in love again, but in the last chorus she admits to a relapse: “Looks like I lied to myself / Looks like true love is gonna always win ... oh Lawd have mercy now,” she wails, but it makes the pain sound mighty fine. If you had any doubts about her agenda, "I'm In The Blood of the Blues” takes care of that. “I'm the jewel in the crown of the mighty kings of Africa / I'm the hands on the shaft of the spear that slew the lion,” she proclaims, backing it with enough bombast to pin pack the ears of doubters. Copeland transforms Ray Davies' composition “I'm Not Like Everybody Else” from a jangly rocker to a soulful blues, Kimbrough backing her gospel shouts with slinky slide on a tune that should be her theme song. Although its a bit of different direction, its still the same Shemekia Copeland, heart and soul intact, a proud spokesperson for all of us.